"...distinction is evident on the first downbeat." "Alan is bringing a set of sounds that haven't been heard before in an L.A. big band"
Composer and pianist Alan Chan was the winner of the first ASCAP George Duke Commissioning Prize in 2015. His imaginative composition “Denali World” was premiered by the 67-piece Symphonic Jazz Orchestra in 2017. He is also a winner of the ArtEZ International Jazz Composition Contest (the Netherlands, 2011), Percussive Arts Society Composition Contests (2004, 2008), together with awards and fellowships from the Los Angeles County Arts Commission and Ucross Foundation, among others. 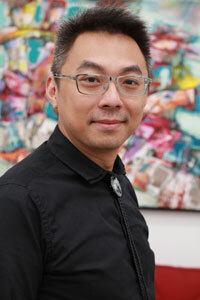 The 17-piece Alan Chan Jazz Orchestra (ACJO) was founded in 2011, and is comprised of top studio/jazz musicians in Los Angeles, to perform compositions and arrangements by Alan. Their debut "Shrimp Tale" album was released in 2014, which received rave reviews and radio plays across the U.S. ACJO continues to appear in Los Angeles venues such as the Baked Potato, Catalina Jazz Club, Typhoon, Vitello’s, Westin Bonaventure Hotel, the Jonathan Club and ShapeShifter Lab in Brooklyn. In recent years, Alan Chan began to collaborate with Chinese instrumentalists to explore the possibility of merging jazz, improvisation and traditional Chinese vibes into an innovative form. ACJO’s new project “Moon Walk,” with pipa (Chinese lute) virtuoso Min XiaoFen (pipa), was premiered on the West Coast in Los Angeles in August 2018 and on the East Coast in Brooklyn Central Library in New York City in February 2019. It received a review from Mark Swed of the Los Angeles Times. "The four movements of Moon Walk…are full of small and large wonders." The “Camel Walk” project, started in 2016 with the prominent performer of suona (Chinese trumpet) Guo Yazhi from Boston, will receive its first performance of the complete version on the Marsee Auditorium stage on May 10, 2019. Professional groups that have presented his works have included Grammy-nominated Brussels Jazz Orchestra, Millennium Jazz Orchestra (the Netherlands), Hong Kong Chinese Orchestra, Taipei Percussion, Symphony Jazz Orchestra and La Jolla Symphony. Alan Chan’s music often takes inspiration from his life experiences around the world, with a take of surprising wittiness and humor. Coming from a classical background, he began composing for jazz big band under the mentorship of Gary Lindsay in Miami, then Vince Mendoza and Shelly Berg in Los Angeles, and Jim McNeely who fanned his flame of desire to create works for jazz ensembles. 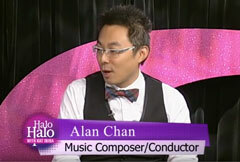 For bookings and inquires, please contact Alan Chan at a@alanchanjazzorchestra.com.